London's deputy mayor has called for changes in the law to reduce attacks by dangerous dogs in the capital. Kit Malthouse will join MPs and union officials at a cross party event in Westminster in central London later. 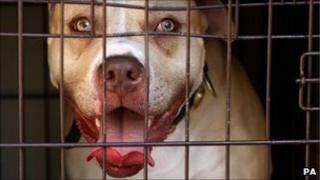 Police seized 1,700 dangerous dogs while 700 ambulances were called out to dog attacks in London last year. Campaigners believe the Dangerous Dogs Act 1991 is increasingly outdated in its approach to combating the problem. "We need some changes in the law," Mr Malthouse told BBC London. "We want stiffer penalties, extension to private land and more discretion for police to deal with dogs more quickly." The government launched a consultation in March 2010 to seek "views on whether current legislation relating to dangerous dogs adequately protects the public and encourages responsible dog ownership". The consultation closed in June after receiving thousands of responses. Animal Welfare Minister Lord Henley said that he would announce the government's approach to dangerous dogs early in 2011. A spokesman for the Dangerous Dogs campaign said: "These dogs and their irresponsible owners are a growing menace for many people across the country in terms of anti-social behaviour and other, more serious crimes." Communication Workers Union (CWU) health and safety officer Dave Joyce said: "The problem of dangerous dogs is not going away. "Horrific dog attacks on children, postal workers and members of the public cannot continue to go unchecked."